Many Americans think the poorest of the poor are simply sitting on their couch and collecting an ever-growing government check. Actually, their benefits have been shrinking. Government aid has been shifting to working families just above the poverty line leaving those at the bottom with a very thin safety net. 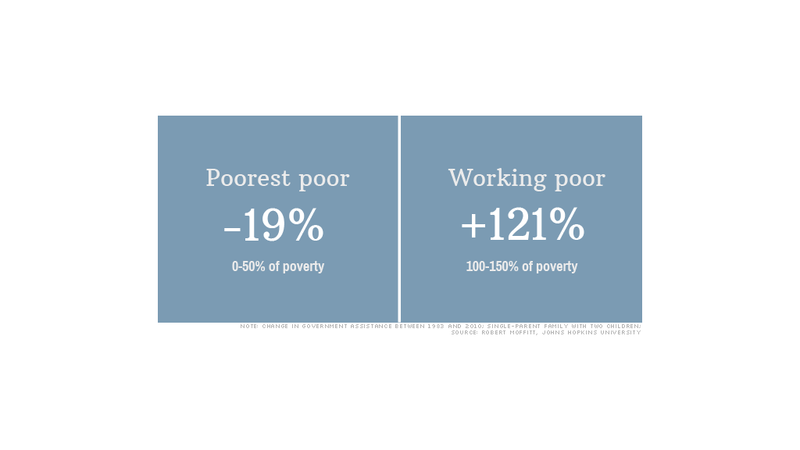 These very poor households have incomes below 50% of the poverty threshold: a single-parent family with two children earning less than than $8,700 a year. This group saw their assistance fall 19% between 1983 and 2010, according to research by Robert Moffitt, an economics professor at Johns Hopkins University. Moffitt looked at the 15 largest social safety net programs, including food stamps and the Earned Income Tax Credit. By comparison, government benefits have more than doubled -- up 121% -- for single parent families just above the poverty line, or those with incomes between $17,400 and $26,100. The gains are even bigger for families with married parents and two children who are just above the poverty line. Those with incomes between $24,000 and $36,000 saw their benefits explode by 246.3%. They now get more assistance than single parent families with two kids in a comparable place on the poverty scale, which was not the case in 1983. The shift in part reflects a policy focus on helping those who work. "If you aren't able to achieve steady employment, you aren't going to get very much," Moffitt said. "You are left out." The main changes came in the 1990s with welfare reform. The resulting Temporary Assistance for Needy Families program imposed work requirements and time limits, and also converted funds into block grants, which meant that states had a set amount of funds to distribute rather than being able to serve all who qualified. Within a decade, the number of adults receiving this aid dropped 71%. Now, the primary help that the poorest Americans receive are food stamps. Women who are pregnant or have small children are eligible for additional food and support services. And, in a few states, poor adults are eligible for Medicaid. Some may get TANF or unemployment insurance, if they used to work. "There are people who are really scrapping by on extraordinary little," said Elizabeth Lower-Basch, senior policy analyst at CLASP, an advocacy group for low-income Americans. On the flip side, those who work -- or the so-called "Deserving Poor" -- are receiving more government benefits. The main policy, the Earned Income Tax Credit, provided up to $5,660 a year for households with incomes up to $48,360 in 2010. The program was expanded greatly in the 1980s and 1990s, and again through the 2009 Recovery Act. The EITC is one of the top policies that increased employment and earnings of families headed by women, according to research cited by the Center on Budget and Policy Priorities, a left-leaning advocacy group. The expansion in the 1990s prompted more than a half million families to move from welfare to work. "It doesn't create a disincentive to work," said Veronique de Rugy, a senior research fellow at the conservative Mercatus Center at George Mason University, explaining its political popularity. Likewise, the Child Tax Credit, which was enacted in 1997, provides working families with up to $1,000 per child. It was expanded in the early 2000s, allowing it to reach more low-income families by making it partially refundable. The Recovery Act reduced the minimum earned income needed to $3,000, which both boosted the number of poor working families who could claim it and the amount they could receive. Even some improvements in the food stamps program made it more accessible for working poor families, Lower-Basch said. People can now apply online and undergo interviews via the telephone so they don't have to leave their jobs. The benefit is available to those with income up to 130% of the poverty line, or roughly $31,200 for a family of four in 2010. "The decline in support to families with non-employed members ... seems to be rooted in the presumption that they have not taken personal responsibility for their own situation," Moffitt said.